Written By Psychotherapist Meg Josephson, L.C.S.W. So you messed up. You are in good company because everyone makes mistakes (including your ex, your friends, your family, your boss). People are inclined to try, mess up, forgive and evolve. ⁣However, it can be especially hard to forgive yourself when your children are on the receiving end of your lapse of judgement or lack of composure. The good news? Kids are resilient and a few slips-ups in high stress scenarios are normal. Bottom line: assuming you're in the range of typical going-through-a-divorce "bad behavior" and you keep your infractions to a minimum, your kids are likely to move past your mistake way faster than you are. Most people (including you!) mean well and don’t intend harm. Know that you were acting with the information you had at the time and that good decision-making and behavior patterns take practice to get right. Mistakes are part of the process--especially the divorce process! Meg Josephson, a licensed clinical social worker in private practice in NYC. She is a frequent relationship advice contributor to it's over easy. 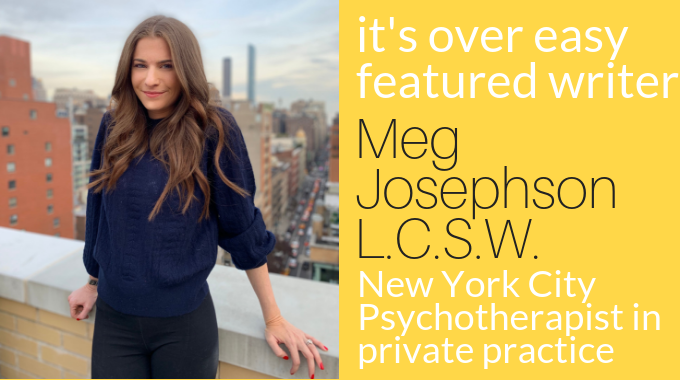 Follow her on Instagram @citytherapist or connect with her on her website at http://www.meg-josephson.com/. As a therapist, she is committed to providing therapy that is both compassionate and practical. Some of her clients seek therapy to address a concrete issue such as the dissolution of a marriage or relationship; others come out of a more abstract sense that something in their lives could be different or more fulfilling. By exploring and defining their personal values, Meg works with her clients to take the necessary steps in developing richer, more rewarding relationships and lives.